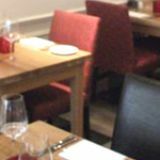 The Jam Cupboard restaurant is located within the Rydges Kensington London and serves Modern European cuisine. A wide range of wines are available from The Jam Cupboard as well as a selection of cocktails. Do you work at The Jam Cupboard? What did you think of The Jam Cupboard? Trotting along leaf-lined Gloucester Road, from the tube station towards Kensington High Street, you’re only a few hundred yards from one of Rydges' posh chain hotels. And located on the end of the white walled building is its newly refurbished Jam Cupboard restaurant. A hotel restaurant through and through, The Jam Cupboard is stylish and modern, yet relaxed. 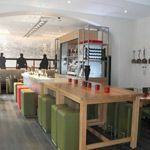 A central, grey marble bar faces you as you enter and is lined with square tubular leather seats in red and lime green. A cocktail barman stands to attention at the bar, looking quite the part with his martini glasses at the ready. The long wall along the left of the room fits a bench table for ten, and a long horizontal canvas hangs above in lime green and browns. 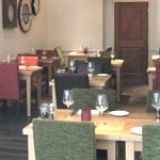 The opposite wall is decorated with four porthole designed mirrors that reflect the square, chunky tables and the dark brown leather chairs in this modern but casual dining room. Faint and relaxed soul music plays in the background as natural light pours into the room from long windows that look out onto the street. A warm glow comes from red candle holders on each wooden table and a large, red knotted lampshade hangs from above. Waiters are attentive and helpful, but not overpowering. Guests look comfortable and at ease. The menu is bound at the spine and stiff - highlighting its newness. It's a relatively unadventurous menu that's pretty much geared to suit most tastes (with plenty of vegetarian options), and whilst the sustainable fish and locally sourced, free-range chickens and meats are certainly admirable, prices are steep enough to make comparison with some of the big boys around these parts. Scallops (£13) to start are pan-seared to perfection, and are served with crushed peas, air-dried ham and pea shoots for a pretty good plateful. The ham hock terrine (£9.50) is set brilliantly and served with toasted spelt bread, handmade piccalilli and herbs. Soup, salad and risotto also appear on a starter list that kicks proceedings off well. 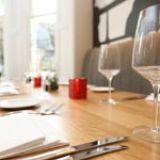 Mains are priced from £14.50 for beer-battered fish and chips, up to £23 for braised shoulder of lamb. The salmon (£18.50) is soft and flaky, and served on top of a creamy olive mash, peas, chorizo cream and pea shoots. Slow-cooked beef cheeks in red wine jus (£16.50) are incredibly tender and mouth-wateringly soft, and a bed of mustard mash is just about the perfect accompaniment. Sides of sea-salted skinny chips, twice buttered mash, roasted vegetables, salad, spinach, new potatoes or green beans can be ordered for £3.50. A bread basket is also available for £3.50, and steaks and burgers also feature. Dessert options are simple and traditional, with things like sticky toffee pudding, chocolate mousse and Eton mess (£5.50) alongside a seasonal fruit salad (£5) or a cheese and biscuits selection (£8-£14.50), for one or two persons. An Australian dessert wine is also listed: Brown Brothers' Late Harvest Orange Muscat (£29). Martini cocktails look like a speciality (£9.50), served from the marble bar at the back of the room. The apple and cinnamon option tastes just as it should, with a splendid hit of spice to finish. A pink passion fruit martini is equally as refreshing and garnished with a slice of the fruit. Wine 'favourites' are listed at £15.95 for the bottle or £4 the glass, and a wine of the month is shown at the front of the wine list, priced at £17.50, or £5 the glass. Don’t write this off as just a hotel restaurant; it’s stylish and relaxed and not as stuffy as most. An interesting enough menu offers some decent flavours, and the martinis are definitely worth a try, making this a decent pit stop spot after shopping on High Street Ken.